Coupons can be used to assist in the evaluation of CP levels in buried steel piping. Editor’s note: Learn more cathodic protection (CP) for steel structures buried in soil in this Materials Performance quarterly special feature, “The Science Behind It.” Once you’ve read the MP article on mixed-metal circuits, explore the science behind the corrosion problem, which is presented in several related CORROSION articles listed at the end of the article. The measurement and interpretation of cathodic protection (CP) data in plants or other complex facilities present inherent challenges where mixed metals are electrically continuous within the protected structures’ CP system. Often there is no attempt to electrically isolate the buried steel piping networks from other metals in the facility for safety and practical considerations. Coupons can be used to assist in the evaluation of CP levels on buried steel piping in mixed-metal circuits; however, the present industry practice of disconnecting the coupon from the mixed-metal circuit to measure the potential and polarization, without other considerations, raises concerns because the instant disconnect condition may not be a true representation of the protection status. Although coupon usage has long been recognized as a valuable tool for evaluating CP conditions on buried piping systems, their use in plants and other complex facilities can increase confusion and raise additional questions on the CP status. Plant facilities frequently include extensive buried networks of bare conductors, including copper, steel-in-concrete, mixed-metal circuits, different fill materials, and protected buried structures that are within the influence of closely coupled impressed current anodes. These and other factors present inherent challenges with regard to CP measurements and the interpretation of data. Depending on the complexity and nature of the facility and equipment, establishing and maintaining electrical isolation can be impractical on networks of steel piping systems within plants. Safety and practical considerations are the key reasons for avoiding electrical isolation devices in classified areas, including the possibility for arcing, reducing touch voltage hazards, and minimizing the propensity for CP downtime, since the failure of a single isolation device in a system can result in complete loss of protection. In critical double containment piping systems, where fabrication requires 100% welded construction, mechanical fittings often are not permitted. In these situations, the CP system is designed to account for the mixed-metal circuit, often using closely coupled impressed current anodes that are distributed throughout the piping network. When coupons are used in this type of system, the coupon is also within the zone of influence of the anode gradients. Coupon size and placement are critical for collecting meaningful data. The coupon size is selected to match the surface area of a typical coating holiday that is anticipated at a specific location, and proper coupon placement can reduce voltage drop errors. It is also important that the coupon be exposed to the same local environment (including any select fill or controlled density fill) that is in contact with the pipe steel at coating holiday(s). Accordingly, it is essential to collect data at sufficient locations so they are representative of conditions throughout the facility. Coupons are commonly used when the CP current sources cannot be interrupted; thus, the “current applied—coupon disconnected” (Vc-a-d) is frequently the accepted measurement. However, the voltage drop (sometimes called IR drop) in the measurement can be significant when the coupon is located within the gradient of closely coupled anode systems. Further, the disconnected coupon potential may not be representative of the normal piping condition in a mixed-metal circuit. When it is possible to interrupt the impressed current CP sources for buried piping, coupon “on” and “off” potentials can be measured while connected and disconnected. •	Is the coupon instant-disconnect potential measurement an accurate representation? •	Is it appropriate to leave the CP system energized during the coupon instant-disconnect potential measurement? •	How can coupon current measurements be used to evaluate CP status? •	Are other CP criteria appropriate for the location? NACE SP0104-2014,2 Section 3.11, discusses the use of coupons in complex piping environments where mixed metals are electrically continuous with the protected piping. NACE Publication 352013 also addresses the use of coupons in detail, stating that the application of polarized potential or polarization criteria is not always technically correct, and during current interruption, secondary voltage drops from circulating galvanic currents can cause errors in the measurements on structures with characteristic potentials that can vary widely. A suggested approach is to acquire these measurements while locally disconnecting the coupon from the structure. The question remains whether the disconnected coupon’s potential measurement is a true representation of the actual mixed-metal circuit condition. Simultaneous interruption of all connections between the carbon steel (CS) piping and the bare copper grounding conductors (not a realistic concept) would not be a valid representation of the CS piping condition when in the mixed-metal circuit. The pipe-to-soil potential would be expected to become more negative when the more noble metal (i.e., copper) is disconnected. Depending on the level of polarization of the mixed-metal circuit, similar behavior can be seen on a coupon when it is disconnected. As shown in Figure 1, the potential of a CS coupon can become more negative when it is disconnected from CS piping that remains connected to bare copper. When this behavior is observed, it suggests a greater accuracy concern as compared to the impact of secondary voltage drops from circulating currents during CP current interruption. The Vc-i-c potential represents the coupon’s mixed-metal circuit polarized potential and is considered to be a necessary measurement for CP evaluation. The current applied and interrupted instant-disconnect potentials are also considered to be required measurements. The native and disconnected depolarized potentials are also important. NACE SP0169-2013, Section 6.3.4, states, “In mixed-metal piping systems, CP can be typically achieved at a polarized potential that is 100 mV more negative than the OCP of the most active metal.” Coupons can be used to meet the intent of this standard by showing that the coupon’s mixed-metal polarized potential is 100 mV more negative than the OCP of the coupon. NACE/ASTM G193-12D5 defines OCP as the corrosion potential—the potential of a corroding surface in an electrolyte measured under open-circuit conditions relative to a reference electrode (also known as electrochemical corrosion potential, free corrosion potential, and OCP). Typically, native potentials are not measured on buried steel piping in plants prior to mechanical completion. Where electrical isolation is not established, native potentials measured after mechanical completion and prior to applying CP are representative of the mixed-metal native state and are not considered to be the OCP of the most active metal. However, a native potential on a coupon can be measured before it is connected to the mixed-metal circuit (after sufficient aging and before initial CP is applied). Upon the application of CP, this measurement provides a baseline to reference the degree of cathodic polarization of the mixed-metal circuit. After CP has been applied, the depolarized potential often differs from the initial native coupon potential. Subsequent evaluations can identify whether the disconnected coupon depolarizes 100 mV or more positive than the coupon’s mixed-metal polarized potential; or, by allowing the coupon to fully depolarize, reestablish its OCP for comparison to the coupon’s mixed-metal polarized potential. If the fully depolarized disconnected coupon potential is desired, the CP system may have to be de-energized for a prolonged time period where coupons are in the zone of influence of closely coupled anodes. The CP system for CS piping in mixed-metallic circuits as described here should continue to be energized to the greatest extent possible to avoid accelerated corrosion at coating defects on the piping because of the galvanic couple to a massive cathode (i.e., bare copper grounding network). The reference electrode should be located as close to the coupon as is practical, as described in NACE SP0104-2014, to minimize voltage drop error in the potential measurements. 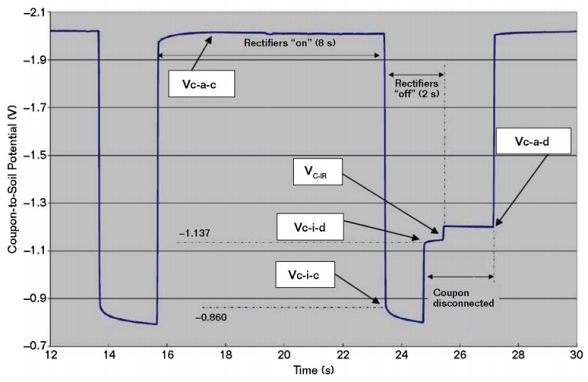 A coupon within the zone of influence of an energized anode, as is the case with closely coupled anodes, can show influence from the CP system regardless of whether the coupon is connected or disconnected. SP0104-2014 recognizes that current-applied coupon potential measurements can include voltage drop error. In this standard, “Appendix D, Coupon IR-Drop Calculation Procedure” provides a method to identify voltage drop error. The most common measurements are Vc-a-c and Vc-a-d. According to NACE SP0104-2014, in mixed-metal circuits, and where the voltage drop may be significant, Vc-i-c and Vc-i-d also should be measured. The difference between Vc-a-d and Vc-i-d is the coupon voltage drop (Vc-IR). In Figure 1, Vc-a-d and Vc-i-d are more negative than the Vc-i-c (i.e., the mixed-metal polarized potential). In this case, Vc-i-d is 277 mV more negative than Vc-i-c and, therefore, not considered an accurate representation of the CS condition in the mixed-metal circuit. The same concern applies for the Vc-a-d measurement. Vc-IR is ~–50 mV, which represents the voltage drop error in the Vc-a-d measurement. In Figure 1, Vc-i-c satisfies the polarized –850 mV CP criterion. However, if Vc-i-c was more positive than –850 mV vs. CSE, the 100 mV criterion can be evaluated by comparing Vc-i-c to the OCP of the coupon. The coupon’s native potential that was established before it was connected to the mixed-metal circuit can be referenced as the OCP for evaluating the degree of polarization during the initial application of CP. While this value also could be used for subsequent evaluations in the mixed-metal circuit case, it is recognized that the depolarized potential can differ from the native potential after CP has been applied. Using the native potential is usually preferable to de-energizing the CP system for a long duration that is sometimes necessary to measure the fully depolarized potential. A shunt with a known resistance can be installed in series with a coupon to determine the current magnitude and direction. With the CP system energized, direct current (DC) pickup can provide an important indication of CP effectiveness at that location. Protective current density can be estimated from the surface area of the coupon, however, in mixed-metal circuits with the attempt to satisfy the –850 mV CSE polarized criterion, the observed current densities can be orders of magnitude greater than typical design CP current densities for bare CS. Current discharge from a coupon is an indication that protection is lacking and corrosion may be occurring at that location. An indication of current pickup during the “off” portion of the rectifier cycle does not necessarily imply that CP is effective, as circulating currents can imply corrosion on the piping at other locations. Currents measured during the off cycle also confirm the caution in NACE SP0104-2014. The difference between the “on” and “off” mV drops across the shunt determines the net current on the coupon. The polarities are important to note in these measurements, as they indicate the direction of current flow. Coupon size, placement, and environment must be carefully considered to provide data that are representative of structural conditions at a variety of locations throughout a facility. In mixed-metal circuits, the coupon’s instant-disconnect potential alone might not be representative of the actual mixed-metal condition. The Vc-i-c potential is considered a required measurement to evaluate protection status in mixed-metal circuits. Measurements should be obtained with the coupon connected and disconnected, and with the current applied and interrupted. Voltage drops can be present in the Vc-a-d measurements, especially in the case of closely coupled anode systems that are common in plants. The 100 mV CP criterion in mixed-metal circuits, referenced from the Vc-i-c potential and the OCP of the CP coupon, meets the intent of NACE SP0169-2013, Section 6.3.4. CP response can differ in soils vs. areas backfilled with controlled density fill where longer polarization and depolarization durations may be observed. CP current pickup during the Vc-a-c condition can suggest effective protection at that location, assuming no sources of foreign interference currents are present. Coupons should be allowed to age until stable native potentials have been established. Coupons should not be connected to the mixed-metal circuit until their native potential is established, and then only when the CP system is ready to be energized. Acknowledgement is given to my colleagues within the Bechtel organization who provided contributions to this article, especially M. Fang, H. Acuna, and D. Chew. 1 NACE SP0169-2013, “Control of External Corrosion on Underground or Submerged Metallic Piping Systems” (Houston, TX: NACE International, 2013). 2 NACE SP0104-2014, “The Use of Coupons for Cathodic Protection Monitoring Applications” (Houston, TX: NACE, 2014). 3 NACE Publication 35201, “Technical Report on the Application and Interpretation of Data from External Coupons Used in the Evaluation of Cathodically Protected Metallic Structures” (Houston, TX: NACE, 2001). 4 W.B. Holtsbaum, “Application and Misapplication of the 100 mV Criterion for Cathodic Protection,” MP 42, 1 (2003): p. 30. 5 NACE/ASTM G193-12D, “Standard Terminology and Acronyms Relating to Corrosion” (Houston, TX: NACE, 2013). This article is based on CORROSION 2017 paper no. 8824, presented in New Orleans, Louisiana, USA. D.A. Jones, “Analysis of Cathodic Protection Criteria,” Corrosion 28, 11 (1972): pp. 421-423. http://corrosionjournal.org/doi/abs/10.5006/0010-9312-28.11.421. Y. Hosokawa, F. Kajiyama, Y. Nakamura, “New Cathodic Protection Criteria Based on Direct and Alternating Current Densities Measured Using Coupons and Their Application to Modern Steel Pipelines,” Corrosion 60, 3 (2004): pp. 304-312. http://corrosionjournal.org/doi/abs/10.5006/1.3287735. G.K. Glass, “Technical Note: The 100-mV Potential Decay Cathodic Protection Criterion,” Corrosion 55, 3 (1999): pp. 286-290. http://corrosionjournal.org/doi/abs/10.5006/1.3283989. M.H. Peterson, “Principles and Criteria for Cathodic Protection of Steel in Sea Water—A Review,” Corrosion 15, 9 (1959): pp. 51-55. http://corrosionjournal.org/doi/abs/10.5006/0010-9312-15.9.51. DOUGLAS E. GILROY is a principal engineer in the Materials Engineering Technology group at Bechtel Oil, Gas and Chemicals, Inc., Houston, Texas, USA. He has 36 years of experience in onshore and offshore CP design, installation, commissioning, and testing, and in pipeline AC interference. He has an M.S. in materials engineering and is a NACE Corrosion Specialist and CP Specialist, Fellow of the Institute of Corrosion, and a registered Professional Engineer in Texas. He has been a member of NACE for 35 years.